technique. We can show your ad reps how to do the same thing. Just e-mail or call us at (631) 477-2505. 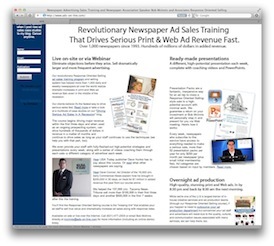 I'm going to share with you an unusual but hugely successful ad sales approach we employed recently at the 24,000 circ. daily Post Register in Idaho Falls, Idaho. It worked so well, it got local businesses emailing and stopping into the newspaper begging to advertise in both print and digital. Some businesses, that had never advertised before, started running huge ads. Other businesses that were already running began running dramatically bigger and more frequently without any argument. And still others came in wanting to buy smaller ads, like a 2 col. x 3", and left signing up for 5 col. x 14" ads on contract (see "after" ad at right). The approach was so well received that it even generated some angry phone calls from businesses asking why they weren't asked to be a part of it, even though it didn't involve any discounting. That's when we knew we were really doing something right. We're expecting the newspaper to generate between $600,000 to $1 million within the year and there's no doubt that you can do the same thing, too. While newspapers are scrambling to sell more print and digital products, most are overlooking the single most effective and easiest way to drive major revenue. It involves focusing less on selling print and digital products and instead on helping local businesses solve their biggest problem of driving customers to their store. Sure, every newspaper knows they should be selling what the customer wants. But the perceived unpredictability of advertising and its subjective nature makes it difficult for a newspaper to prove, upfront, that an advertiser's cash register will ultimately ring. But that's exactly what we've figured out how to do with both print and digital, and, as result, we've helped generate hundreds of thousands of dollars in revenue for many of our clients over very short periods of time. For this very busy ad staff in Idaho (and others like them), we're even doing much of the day-to-day heavy lifting involved when selling advertising, including doing the homework, analysis, developing the strategies for prospects, and one-on-one sales coaching through a powerful yet inexpensive service we developed called Presentation Packs (join us this Thursday at 12 noon for a quick demo of how that cost-effective service works). So what exactly did we do for the Post Register? As always, the goal was to drive significant print and digital revenue by teaching their ad reps, designers, and managers a unique approach that enables the ad reps to ultimately prove, upfront, to their prospective advertisers that they'll get a response. Part of this, of course, involved teaching the newspaper how to deliver that response. To show the ad reps how it's done, I conducted a seminar for the local business community. It was easy to promote and get people to attend (in fact, there was so much demand, we had to move to a larger ballroom). The unusual thing was that there was no sales pitch and very little talk about the newspaper's products. No rates were discussed. To the audience, it appeared simply to be a seminar on how to create strategies that'll work in print and digital. To be sure they bought into it, every point was drawn out of the crowd by tying it into similar dynamics they've experienced elsewhere in their lives. In effect, the approach was their idea. 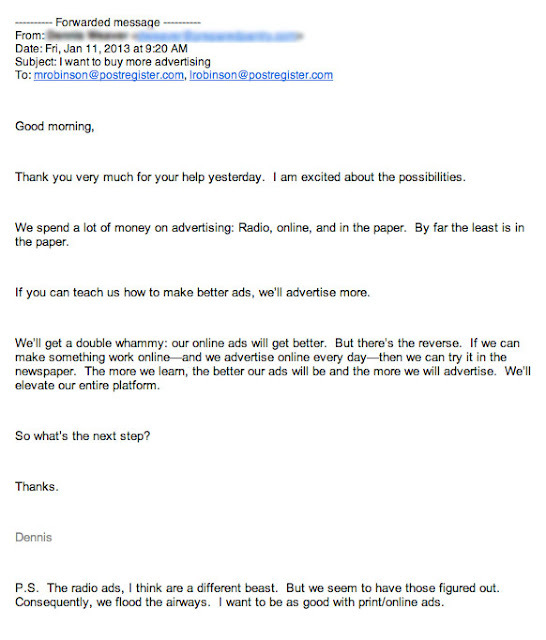 At the end of the session, I mentioned that the ad reps at the Post Register were well-versed in these techniques and would be happy to help them create a strategy. In fact, we put an account profile questionnaire on each seat they could fill out to get the process started. 1. 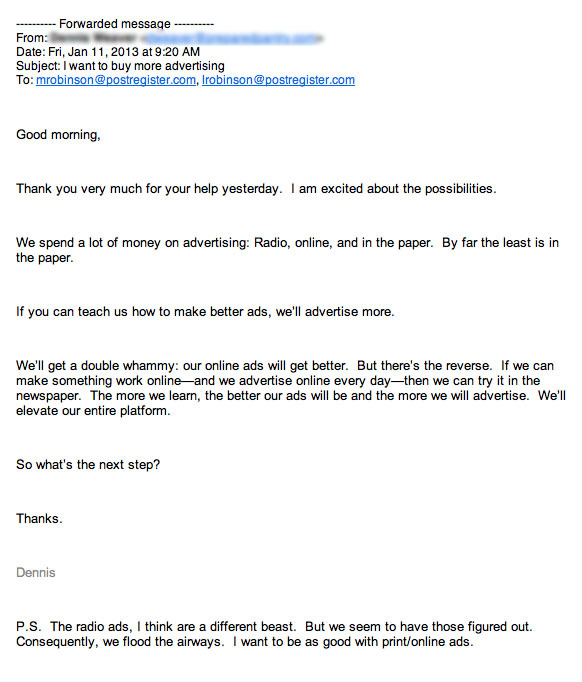 Immediately after the session, current and prospective advertisers approached the publisher, ad director, and the ad reps wanting to start the process. 3. In addition to those that approached us immediately after the session, later that day the seminar attendees began walking into the newspaper announcing they wanted to start advertising. 4. The ad director began getting complaints from the business community. Evidently, word of the seminar spread to others who had not been invited (or missed the ad we ran) and wanted to learn the techniques their friends were talking about. Of course, part of my training is to ensure the ad reps learn how to teach the techniques and use the sales approach, too, so they were able to handle the inquiries, and in the process they could shift from the "vendor" mode to the "partner" mode, opening up the entire sales process so they could ultimately recommend an entire strategy. And since this newspaper signed up for my once-per-week Presentation Packs, where I work out entire strategies for a different high-potential customer each week (and then record a video series around each one showing how to conduct each call and close the sale), the Post Register are making print and digital sales as quickly as they can present them. We're expecting $600,000 to $1,000,000 this year in added revenue. My program isn't for every newspaper. Those that embrace my approach and do well are those who believe the fastest way to the sale is by solving the prospect's problems. And since all the prospect really cares about is getting their cash register to ring, we teach the ad reps how to prove they can do that. If this is your philosophy, too, why not give me a call and we can chat more about your specific situation and how I might be able to help, through on-site training or, if you're a smaller publication, through the Webinars and coaching videos in our Presentation Packs. What are your thoughts on this approach? I'd love to hear them.